Artists, curators, and foundation supporters from the South and beyond will gather together in Oakland Park, near Miami, to discuss visual impairment. Wandering Masters Art Salon is a new creative group founded by three visual artists; Carlos Cesar Alves, Dana Blickensderfer, and Jonatas Chimen. 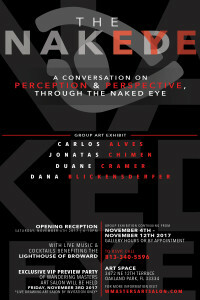 The group collaborated to host The Naked Eye, a group art exhibit, that is a conversation on perception and perspective through the naked eye. The exhibition is all centered around the organization The Lighthouse of Broward, and its cause for the visually impaired community that will run through early November 2017 at 3472 NE 12th Terrace, Oakland Park, Florida. The exhibit features print work, sculptures, and multimedia pieces from acclaimed artists and photographers, who explore themes of prejudice, gender issues, immigration, and physical impairment. An accompanying public reception held on Saturday, Nov. 4, will give the artists, as well as other members of The Lighthouse of Broward, a chance to talk about their work in depth. The featured artists include Carlos Cesar Alves, Dana Blickensderfer, Jonatas Chimen, and Duane Cramer. Carlos Cesar Alves is a process-based Brazilian artist, specializing in rezin work in both 2D and 3D form. His current work offers a look at a monochromatic world, which stems from the effects of color blindness. Dana Blickensderfer, founder of Provoke Art and co-founder of iBoss Advertising, works currently comment on a fascination with Egyptian art, Arabic symbolism, and in European modernism which helps bring her concerns for womanhood, intersectional feminism, and women in business, to light. Brazilian-American Symbolist artist and author Jonatas Chimen, display work, whether 2D, 3D, Performance, or Time-Based formats, keeping the reoccurring theme of embracing one’s cultural identity through his incorporation pastiches of immigration documents, DNA tests, and personal diaries. Duane Cramer uses photography to change the narrative of black men in popular culture. While he has photographed such famous people like Samuel L. Jackson, Rev. Jesse Jackson, and Adam Levine, he offers his artistic eye to capturing HIV activists, trans advocates, homeless people, and foster kids. The opening reception opens to the public on Nov. 4. The exhibition continues from Nov. 4 through Nov. 12 at 3472 NE 12th Terrace Oakland Park, Florida. An opening reception will be held on Nov. 4 from 6-10 p.m. honoring The Lighthouse of Broward with live music and cocktails benefiting the organization. 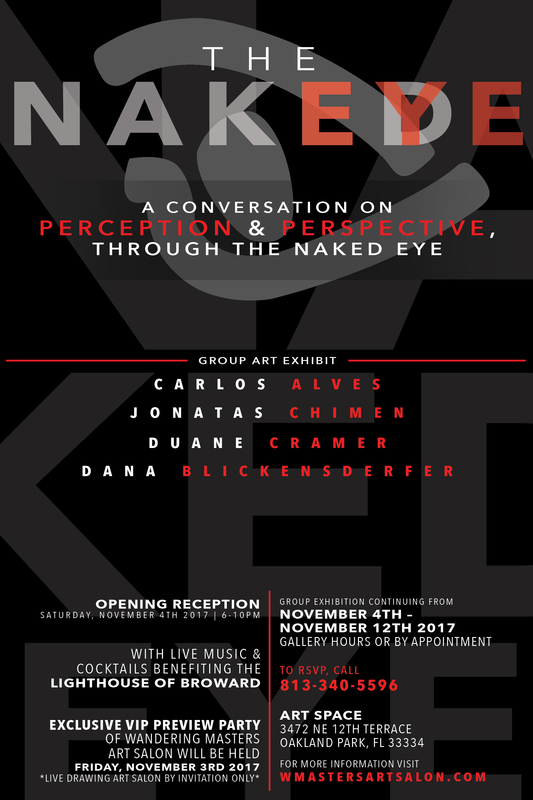 The Naked Eye exhibition is said to be a one-time event, but the space and its members will continue to hold community events, through the Wandering Masters Art Salon, that explore such themes, especially given the visual impairment impact surrounding the artists and its community members. Wandering Masters Art Salon is a new creative group founded by three visual artists; Carlos Cesar Alves, Dana Blickensderfer, and Jonatas Chimen. They come together to ignite the passion for the arts through live performances, drawing atmosphere and a wide range of exhibitions, with guest artist participation. The salon’s environment is set to be much like the salons of the 19th Century; Wandering Masters Art Salon contributes to various interactive exhibitions by other living artists whose works all have a focal point to the thematics around contemporary society, specific academic subjects relating to progressive art and controversy. For more information visit wmastersartsalon.com.